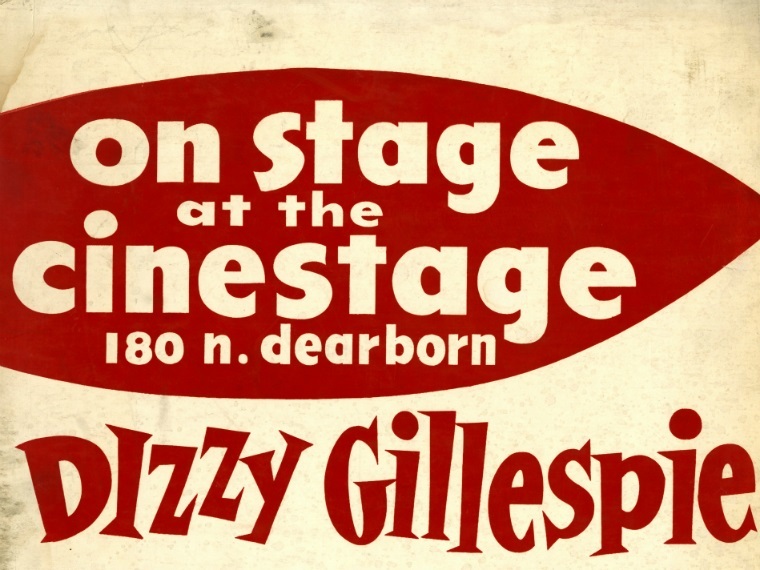 Top half of a poster promoting a show with Dizzy Gillespie and his Quintet with Joe Williams at Chicago’s Cinestage in 1962.Source: William McBride, Jr. Papers, Chicago Public Library. 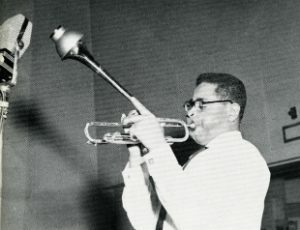 Dizzy Gillespie’s album Afro, circa 1950. On this album, Gillespie fused Afro-Cuban music with American jazz.Source: William McBride, Jr. Papers, Chicago Public Library. Source: William McBride, Jr. Papers, Chicago Public Library. John Birks "Dizzy" Gillespie was born a century ago on October 21 in Cheraw, S.C. Let's celebrate the life and music of this talented jazz trumpeter and composer this Throwback Thursday. 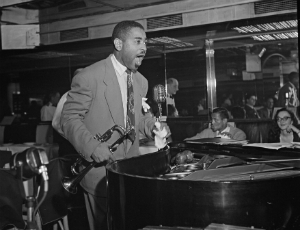 Dizzy Gillespie, known for his "swollen" trumpeter cheeks, got his start in the mid-1930s by working in prominent swing bands, including those of Benny Carter and Charlie Barnet. 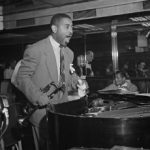 He later created his own band and developed his own signature style, known as "bebop," and worked with musical greats like Cab Calloway, Ella Fitzgerald, Earl Hines, Charlie Parker and Duke Ellington. Gillespie's trademark was a special trumpet made with a 45 degree raised bell. He discovered that he preferred the sound after his normal trumpet's bell got bent upward in an accident during a party in 1953. Learn more about Gillespie and his sound with these recommendations. Looking for unique, rare artifacts? Check out the William McBride, Jr. Papers, an archival collection held at the Harsh Research Collection at Woodson Regional Library. From the 1930s through the 1980s, McBride was an artist, political activist and collector of Bronzeville cultural memorabilia. 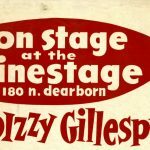 The collection includes posters and memorabilia related to Dizzy Gillespie and other talented performers such as Charlie Parker and Sammy Davis, Jr.
For an insider look at Chicago's jazz and blues scene, explore the Charles Walton Papers, another archival collection held at the Harsh Research Collection. Walton was a jazz drummer, music educator and author of "Bronzeville Conversations," a research and oral history project that documented the jazz and blues world in black Chicago. To Be, or Not-- to Bop is the memoir of Dizzy Gillespie written with Al Fraser. This entertaining biography includes reflections from famous Gillespie associates Cab Calloway, Count Basie, Miles Davis, Thelonious Monk and many others. Dizzy Gillespie is part of a series on American jazz performers. It's a great selection to introduce middle school kids to Dizzy Gillespie. A Great Day in Harlem tells the story of when photographer Art Kane assembled 57 of the greatest jazz stars of all time and snapped a famous image in front of a Harlem brownstone in August 1958. This Academy Award-nominated documentary examines the fascinating lives of the musicians who showed up that day to make history. Through remarkable interviews with nearly 30 jazz greats (including Dizzy Gillespie), this documentary showcases legendary black performers. Dizzy Gillespie: Night in Chicago is a recording of a live club date from the late 1980s, with Diz joined by Sayyad Abdul Al-Kahbyyr on sax, Walter Davis, Jr. on piano, John Lee on electric bass, and Nassyr Abdul Al-Kahbyyr on drums. Selections include "A Night in Tunisia," "Swing Low, Sweet Cadillac," "'Round Midnight" and "Nature Boy." Bebop was finally recorded in Carnegie Hall and captured on Diz 'n Bird at Carnegie Hall in September 1947. Listen to the sweet sounds of Charlie Parker and Gillespie on this 1997 CD. Recorded in 1957, Sonny Side up is a favorite with fans of jazz. Gillespie plays with talented bebop tenor saxophonists Sonny Rollins and Sonny Stitt. Need more music? Explore music with us through this year’s One Book, One Chicago selection I’ll Take You There. What's your favorite song by Dizzy Gillespie?